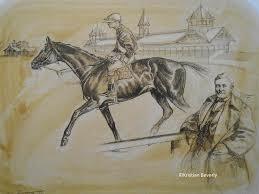 Aristides (1872–1893) was a U.S. thoroughbred racehorse who won the first Kentucky Derby on this date in 1875. Aristedes, a chestnut thoroughbred with a white star and two hind stockings, was bred by Hal Price McGrath and foaled in 1872. He was sired by the great English stud Leamington, which made him a half brother to another great sire, Longfellow, who, during his racing career, was called “King of the Turf.” McGrath did not consider Aristides first rate, though his dam (Sarong) was by one of the United States’ greatest sires, Lexington, whose bloodline went back to Glencoe and Boston. 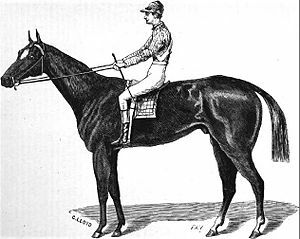 Aristides (named for his breeder’s good friend and fellow horse breeder, Aristides Welch, who owned Erdenheim Stud and had imported Leamington into the United States) was foaled late in the season and was small, never standing taller than about 15 hands. His stable mate, the bay Chesapeake, also sired by Lexington, was expected to do better at the races. Price McGrath was born to poverty in Woodford County, Kentucky, and had gone west for the great California Gold Rush. He did well enough to open a gambling house in New York. In a single night, he won $105,000, which allowed him to return to Kentucky and establish a stud farm. Both Aristides and Chesapeake were born and bred on the McGrathiana Farm in Fayette County, Kentucky, a short distance from Lexington. Fifteen horses were entered in the first Kentucky Derby, two of them fillies. The track was fast, the weather was fine, and 10,000 people were in attendance. Aristides was one of two horses entered by Hal McGrath. The other was Chesapeake. Both horses wore the green and orange silks of H.P. McGrath. Trained by future Hall of Famer Ansel Williamson, an African-American, Aristides was ridden by Oliver Lewis, also African American. McGrath expected the smaller speedball Aristides to be the “rabbit.” He was to go out in front fast and force the pace so that Chesapeake, considered the better McGrath horse, could stalk the front runners, and, when they and Aristides tired, come from behind to win. Just as McGrath had planned, Aristides broke in front and took the lead, but McCreery quickly overtook him near the end of the first quarter. Aristides fought back to lead again, followed by McCreery, Ten Broeck, Volcano, and Verdigris. Chesapeake, meanwhile, was almost the last to break and was not doing much at the back of the pack. As the “rabbit,” Aristides kept increasing his lead until there was virtually no chance that Chesapeake could catch up. Aristides’s jockey, Oliver Lewis, knowing he was not supposed to win, looked to owner McGrath, who waved him on. Both Volcano and Verdigris challenged Aristides in the stretch, but Aristides won by a length and took the $2850 prize. Ten Broeck finished fifth and Chesapeake eighth. Aristides, again ridden by Oliver Lewis, came in second in the Belmont Stakes, the race that today is the third race in the Triple Crown of U.S. thoroughbred horse racing. 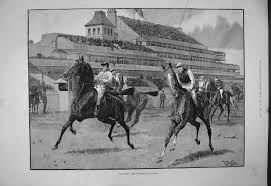 He also took the Jerome Handicap, the Withers Stakes, the Breckinridge, and a match race over Ten Broeck. He came in second in the Thespian Stakes and the Ocean Hotel Stakes and was third in the Travers Stakes. 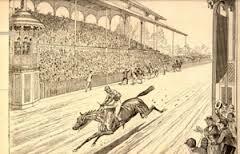 On 10 May 1876, Aristides set the fastest time on record for two and a half miles at 3:14 at Lexington, Kentucky. Ten Broeck finished second in this race for four-year-olds. In total Aristides raced 21 times with 9 wins, five places, and one show. Aristides died on June 21, 1893. 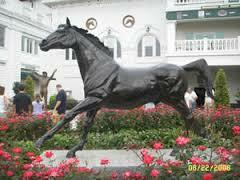 In 1988, the Aristides Stakes was inaugurated at Churchill Downs to honor him. A life-sized bronze statue of Aristides by Carl Regutti stands in the Clubhouse Gardens as a memorial. My late wife was born in Louisville into a Kentucky family with a long pedigree of its own. Nothing symbolized her long heritage and love of Kentucky more than the Derby (pronounced D-er-by in the U.S. fashion and not the English D-ar-by). She bought the racing form the day before and studied the field, eventually picking her favorite. On the day, she watched the coverage for hours and hours prior to the race, with breaks during the commercials to make mint juleps and cornbread. I looked after the Kentucky burgoo and collards, both of which have to simmer long hours. I gave a recipe for burgoo here http://www.bookofdaystales.com/stephen-foster/ . I’ve not made it since Deborah died 8 years ago even though it’s one of my favorite stews. It’s one of those dishes that is so evocative of time and place. I’ve made cornbread since, but when she was alive that was always Deborah’s domain. “Who makes the best cornbread?” is one of those questions Southerners fight over (as is “Who makes the best fried chicken?”). I’ll go with Deborah’s mother on both counts. I’m hopeless at both although I think my burgoo and collards pass muster. With cornbread you just have to have the knack born of decades of experience. Deborah made hers in a cast iron skillet, jet black with age. I had my own skillet which took over 5 years to “season” to the same depth of blackness. It was probably my most valued tool in the kitchen. For cornbread there is no finer weapon. Here’s a fairly standard recipe that produces a moist, fluffy interior and a golden crisp side and bottom. Mix the dry ingredients well in one bowl, and the milk and egg together in another. Make a well in the dry ingredients and pour the wet ones in to combine, using a wooden spoon to mix. Work the batter gently until you spot no dry ingredients, and do not overmix. You are aiming for a batter that is moist but not soggy (this is where experience comes in !!). Let rest for 5-10 minutes. Meanwhile heat the skillet in the oven until it is hot. Place the skillet on the stove top, add the butter, and swirl it around as it is melting to coat the bottom. Pour in the batter and return the skillet to the oven. Bake until the cornbread is golden brown and a toothpick inserted in the middle comes out clean (15-20 mins). 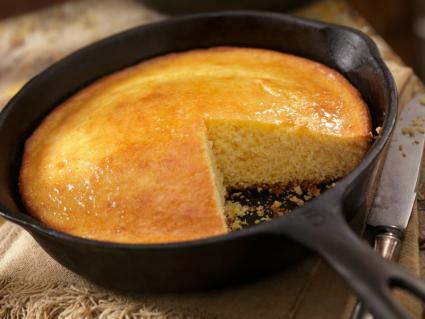 Cool the skillet on a wire rack for a few minutes, then cut the cornbread into wedges. Slice the wedges open and spread with softened butter. Serve on a heated plate.